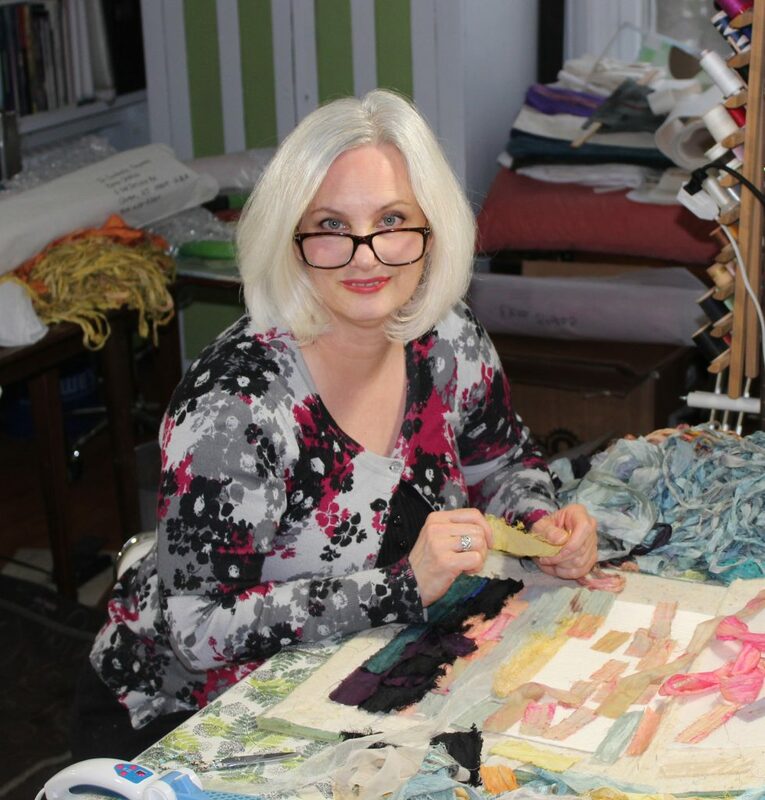 New Jersey textile artist Elena Stokes works with repurposed silk saris, artisan dyed cottons and commercial textiles to create abstract and impressionist landscapes. 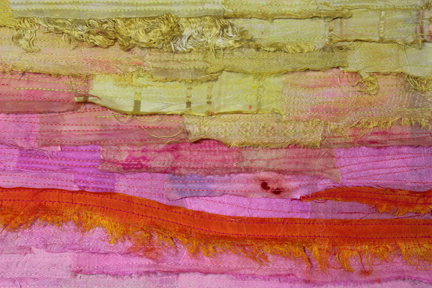 Tearing, layering and stitching add highly textured surfaces to her textile collages. Drawn to open spaces and vast horizons, her work evokes a sense of quiet, endless tranquility. Early artistic pursuits were in theater arts where she earned an Associate of Occupational Studies from the American Academy of Dramatic Arts in New York. A chance course on quilt making at The New School/Parsons led Stokes to explore the visual arts through textiles. Mostly self-taught, her work has won awards, has been invited and juried into numerous exhibitions, including Quilt National, has traveled nationally and internationally, has been published in numerous books and magazines and can be found in private collections throughout the US and Europe. For more than 20 years, Stokes lived and worked in New York City before moving to rural west New Jersey where she currently resides. I lived and worked in New York City for over 20 years. When I was young, the city was exciting, energetic, fun. It was the place to be… until it wasn’t. The pushing and the pulling, the dirt and the noise. Everything was gray. It became oppressive, relentless and claustrophobic. I needed to get out. I needed space. I needed to breathe. Moving to the quiet, open spaces of the country was transformative. The first thing I noticed was the air, it smelled sweet. I couldn’t get enough of it. And, there was so much green and so much sky. Literally and figuratively, new horizons materialized. In my work, the horizon line is a symbol of that change and transformation. It's more than a reference to my move from the city, it speaks to a shift in consciousness and to the endless process of transformation. Even today, driving along the country roads, I'm routinely in awe of the rolling hills, the open skies and stunning sunsets. And, when the outside world becomes too much and too loud, I walk down through the woods to the river on our property and listen to the soft rush of water over rocks, watch the light play across the water and wade up to my knees in coolness. This is the peace and quiet that soothes my soul. The peace and quiet that inspires my art. The structure of my work is founded on the basic elements of a quilt - three layers consisting of a complex surface, an interior batting and a fabric backing - all held together with stitch. The quilt maker's historical practice of reusing old clothing ties in with my reuse of discarded silk saris from India, saris imbued with their own history and carry the stories of the women who wore them. These silks have had their own transformative journey - created by silkworms, spun and woven into fabrics, worn by women until no longer serviceable, discarded then salvaged and somehow ending up in my studio half way around the world. The beautiful silk sari remnants, torn and tattered, vary greatly in color, weave and weight, each bringing a variety of sheen, pattern and texture to my surface designs. It's a slow process of cutting and layering each piece of silk, pinning and re-pinning until they are fused and stitched into place. Quilting lines are long and horizontal, edges are left frayed and unfinished to support the sense of endlessness. The distressed quality of my layered and stitched textile collages adds to the visual and metaphorical language of the work which embraces the beauty of the imperfect and precious fragility of the impermanent. By blending textiles and textures with the transformational, I arrive at a visually layered destination of color, line and space.